ARE MORMONS LIKE GLENN BECK CHRISTIANS? 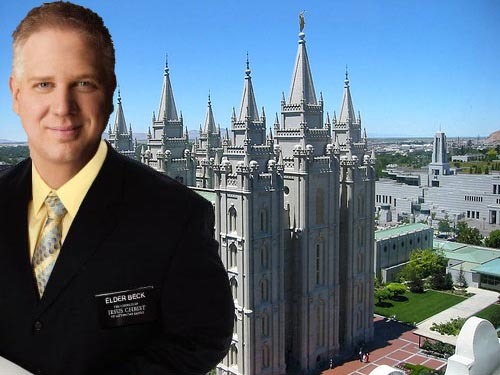 The main objection to viewing Beck as an advocate for the gospel is that the theology of the LDS Church, of which Beck is a member, is radically incompatible with the biblical gospel. The divide between biblical teaching and Mormon doctrine is so wide that from an evangelical perspective Mormonism falls outside the circle of acceptable, authentic expressions of the Christian faith. All human beings preexisted in heaven, where they were the offspring of heavenly parents (God the Father and a “heavenly mother”), before their natural conception here on earth. Our Heavenly Father was a man who became a God—proving that we, too, can become gods. Jesus Christ is the “firstborn” of God’s billions of spirit children and the first of those children to become a God. As such, Christ is one of three Gods in the “Godhead,” as is the Holy Spirit, another of God’s spirit sons. Christ is the “Only Begotten,” which means that he is the only human being whom God the Father literally begat in the flesh. God is Jesus’ literal father in the flesh (allowing Jesus to “inherit” some divine powers other humans do not have) and Mary is his literal mother. Christ’s atonement guarantees immortal life in some heavenly kingdom to virtually all human beings, including those who willfully reject Christ. Christ (and God the Father) appeared to Joseph Smith to tell him to join none of the churches because all of them were wrong and their creeds were an abomination. Through Joseph Smith, God restored lost scriptures (e.g., the Book of Mormon) and inspired new ones (Doctrine & Covenants), from which Mormons learn the doctrines that set them apart from the rest of Christianity. Christ organized the only true Church in these latter days with a hierarchical system of “priesthood authority” required to teach or baptize others. Full forgiveness of sins and entrance into the highest heavenly kingdom, where God and Christ live, come to those who become members of the LDS Church, follow its teachings, and participate in its temple rituals, notably baptisms and other rites performed on behalf of the dead. The ultimate goal of the gospel and of LDS religion is to become gods, with the same powers and potential as the Heavenly Father. You can find full documentation and discussion of these doctrinal problems in the LDS faith on the website of the Institute for Religious Research (IRR), where I am the director of research. In particular, we provide a thorough analysis of the doctrine taught in the LDS Church’s basic manual on doctrine, called Gospel Principles.